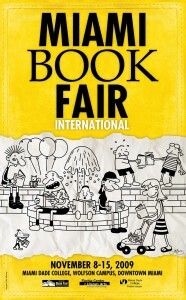 The Miami Book Fair International will again treat book lovers to more than a week of cultural and educational activities, including author readings, book signings, the beloved Evenings With series, the IberoAmerican Authors program, the popular Street Fair Nov. 13 – 15 on the actual closed streets of downtown Miami surrounding the campus, Children’s Alley, and much more. In addition, there are plans to hold a free reception every night prior to the evening presentations called Twilight Tastings thanks to the support of sponsors. Also, people paying the admission to the evening sessions are eligible to receive a $5 discount on any of the authors’ books at anytime during the Fair or toward the purchase of any book prior to Dec. 31 at any Books & Books location. This does not apply to complimentary tickets.